Welcome back to our blog! Maintaining a clean bathroom is a must to keep away dirt, grime, and germs. Your bathroom is the sacred space in your home where you clean, groom, and primp yourself daily, so you want this room to be tidy and neat. But as with every other room in your home, the surfaces in your bathroom can become caked with all sorts of grime, soap scum, and other debris that can make your bathroom surfaces look dull, drab, and just plain gross. 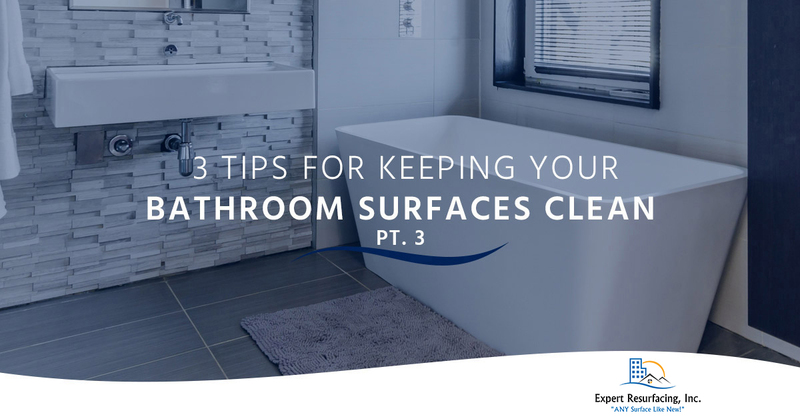 As your Top Rated Local® bathtub resurfacing experts in Virginia Beach, we have three more tips for you to consider so that you can keep your bathroom surfaces effortlessly spotless. Follow the links to read parts one and two of this blog series to learn the cleaning tips we have previously discussed. And if your bathroom vanity, shower, or bathtub could use some TLC, call Expert Resurfacing to schedule a consultation. Read on to learn our pro bathroom cleaning tips! Whether you have a tiled vanity, tiles in your shower, or tile flooring, these features can make a bathroom look stunning. But when your tiles have that dull film coating or the grout looks a mess, it can affect your bathroom’s entire appearance. Ceramic tile requires care in order to keep it looking elegant. When cleaning your tiles, avoid using bleach or ammonia which can stain the grout. Opt instead for ceramic tile cleaners that are designed to keep tiled surfaces looking clean and shiny. You’ll also want to skip the abrasive tools which can damage the glaze on tiled surfaces and, instead, use a broom, mop, sponge, cloth, or microfiber towel to clean these surfaces. Look for an upcoming blog post that will focus specifically on maintaining your recently resurfaced tile surfaces for a detailed guide on how to clean and care for these areas. Showers are the places where we get ourselves clean and destress from a long day at work. But when these areas are covered with shower scum, it can be hard to enjoy our shower time. Getting rid of shower scum doesn’t have to be incredibly difficult if you keep up with cleaning your shower surfaces regularly. Rather than fumbling with two different shower cleaners and multiple sponges, simply fill up a dish wand with one part dish soap and one part vinegar. This effective cleaning combination will cut through shower grime — leaving your tub and shower sparkling. Of course, if the damage is too far gone, you might consider calling our team for a shower resurfacing that can transform your shower and tub from drab and dirty to bright and immaculate. Unlike other surfaces, glass and fiberglass shower enclosures require specialized care. When cleaning your shower doors, avoid using abrasive tools and cleansers that could scratch the surface. Instead, use either multipurpose cleaner or a baking soda and vinegar solution to eliminate soap scum and leave a sparkling surface once the mixture is rinsed away. Sometimes, it’s best to call in the experts to rejuvenate your bathroom surfaces with a bathroom resurfacing. Whether your bathtub is stained, your shower tiles are hopelessly covered in grime, or your vanity countertops could use an update, Expert Resurfacing is here to help. We offer high-quality bathtub resurfacing, shower resurfacing, vanity resurfacing, tile resurfacing, and more! Call our Top Rated Local® Virginia Beach resurfacing company today and get the beautiful, unblemished bathroom you’ve always wanted in just one day! 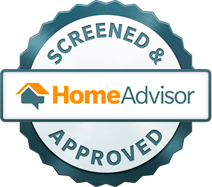 This concludes our blog series, but be sure to visit our blog next month to learn more about our resurfacing services, helpful home care tips and tricks, and more! Until next time, thank you for reading!